Sometimes you need to process parameter business rules that extend beyond the capabilities of a query language (like T-SQL or MDX) and it may just be easier to use a custom programming solution to manage a report dataset query and related report behavior. In our recent book "Professional SQL Server 2012 Reporting Services", I approached this topic in Chapter 21, beginning in Page 692. This post is an extension to that topic and here, I’ll explore the technique at greater depth. 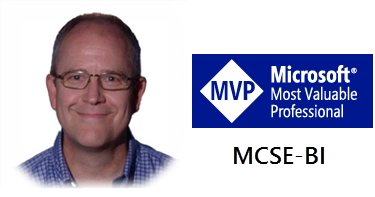 T-SQL and MDX are great query languages and have some support for handling conditional logic but sometime you may just need to use a true programming tool to handle parameter exclusions and conditional logic. To handle the real hard conditions, often the best approach is to programmatically assemble parts of the query as conditions dictate. The example that I will use in this post is not all that complex and much of it could easily be handled using more conventional methods. The problem with creating demonstrations is that it can be very difficult to simulate, in concise and simple form, some of the real vexing problems that we encounter on real live projects. And I’ve got some nasty ones out there – it’s just tough to boil down some of the design challenges into simple examples. So… trust me. The technique I’m demonstrating can be quite valuable, and in some cases; necessary. The design pattern: Use an external custom method to assemble a T-SQL statement based on several parameterized arguments. The assembly will be developed in Visual Studio, with the full suite of coding and debugging tools, in a class library project that can optionally be part of the same solution as the report project. After testing, the assembly will be deployed to trusted folders where it can be used in the SSDT/BIDS report designer and on the report server. I’ll use a Visual Basic.NET project but you could just as easily use C#. 1. With the SSRS Student Labs project open in SSDT, drop-down the File menu. 3. In the Add New Project dialog, under the Installed Templates pane, select Visual Basic. 4. In the center pane, select Class Library and name the project Report_Class_Lib. 5. In the Solution Explorer, change the name of the default class file to ReportLib.cls. In the following example code, the line continuation characters are optional and are provided only so this code fits on the printed page in these instructions. If you prefer, you can omit the underscore and the carriage return on reach line that ends with an underscore. 6. After the Public Class ReportLib declaration, enter the follow code on a new line. Visual Studio’s Visual Basic code editor will assist you with code completion and debugging. Use these features to complete the code and save yourself some work. When a list of objects is presented, use the arrow keys to select the appropriate object and then press Tab to add it to your code. Press the Enter key to select an object and add a new line to the code. MonthName, " & "SalesTerritoryCountry, SUM(SalesAmt) AS SalesAmt, SUM(OrderQty) AS OrderQty"
Dim sFrom As String = "FROM vSalesByTimeAndTerritory "
If IncludeFrieght Then sSelect &= ", SUM(Freight) AS Freight "
Dim sWhere As String = ""
& " AND " & YearTo.ToString() & ") "
sWhere &= "SalesTerritoryCountry = ‘" & Country & "’ "
sWhere &= " AND SalesTerritoryCountry = ‘" & Country & "’ "
7. Check the code for errors and warnings that will have red or green squiggly lines under keywords. You are encouraged to write this code yourself using the code completion and debugging tools in Visual Studio. 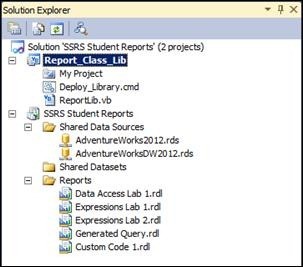 If you need some help or would like to speed up this lab, you can open the SSRS Completed Labs solution and copy the code from the completed version of the Report_Class_Lib project. 8. In the Solution Explorer, right-click the Report_Class_Lib project and select Build from the menu. 2. Click in the address box and copy this path to the clipboard. If you are an experienced Visual Studio developer, you can replace steps 3 through 11 with another approach to simplify deployment… Create a build event in the class library project properties to copy the assembly file at the end of the build process. Define a post-build event (on successful build). Instead of creating a CMD file, enter the two COPY commands below into the post build event script. 3. Create a new text file in this folder and name it Deploy_Library.cmd. 4. Right-click the file and open it in Notepad. 5. Enter the following command line text into the file. You can start by pasting the path you copied from Windows Explorer in place of the first path in each of the two statements. Note that there are no carriage returns in the two COPY commands. Enter all of the text for each COPY command into one line with to file paths in double quotes. COPY /Y "C:\Users\Administrator\Documents\Visual Studio 2010\Projects\Report_Class_Lib\bin\Debug\Report_Class_Lib.dll" "C:\Program Files (x86)\Microsoft Visual Studio 10.0\Common7\IDE\PrivateAssemblies"
COPY /Y "C:\Users\Administrator\Documents\Visual Studio 2010\Projects\Report_Class_Lib\bin\Debug\Report_Class_Lib.dll" "C:\Program Files\Microsoft SQL Server\MSRS11.MSSQLSERVER\Reporting Services\ReportServer\bin"
COPY /Y "C:\Users\Administrator\Documents\Visual Studio 2010\Projects\Report_Class_Lib\bin\Debug\Report_Class_Lib.dll" "C:\Program Files\Common Files\Microsoft Shared\Web Server Extensions\14\WebServices\Reporting\bin"
6. Close Notepad and save changes to the command file. 7. Add this file to the class library project using Add > Existing Item… from the Solution Explorer project right-click menu. 9. Click the Add… button and in the Add Program dialog, use the ellipsis button (…) to browse to the Deploy_Library.cmd file (you’ll need to change the Files of type drop-down option to All Files *.*). 10. Accept the default Friendly Name and click OK to accept the file addition. 11. Click the Set as Default button on the Open With dialog. Click the OK button to save this setting. A command window should open momentarily and then close. You can double-click the Deploy_Library.cmd file in the Solution Explorer any time to ensure that the latest library is deployed. These folders are trusted locations for libraries referenced and run by Reporting Services. The first path supports the report designer development environment. The second path is trusted by the report server. As updates are made to a library, be sure to copy it to both of these folders. 1. Create a new report named Generated Query. 2. Choose Report Properties… from the Report menu. 3. In the Report Properties dialog, select the References page. 4. In the Add or remove assemblies section, click the Add button. 5. Click the ellipsis (…) button on the right side of the new line. 6. In the Add Reference dialog, choose the Browse tab and locate the Report_ClassLib.dll in C:\Program Files (x86)\Microsoft Visual Studio 10.0\Common7\IDE\PrivateAssemblies. 7. Select the Report_ClassLib.dll file and click OK to add the reference. 8. In the Add or remove classes section of the Report Properties | References page, click the Add button. 9. 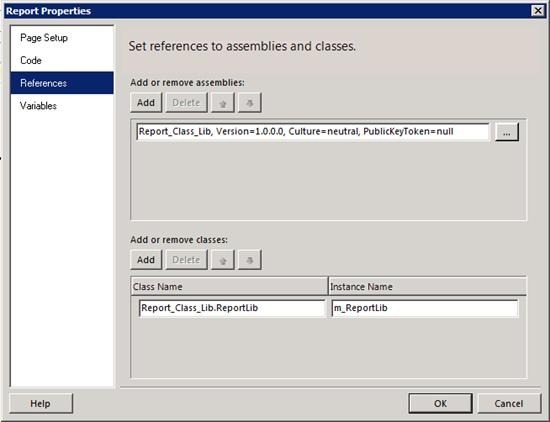 In the box under the Class Name column, enter the namespace and class reference in the assembly: Report_Class_Lib.ReportLib. 10. In the box under the Instance Name column, enter m_ReportLib. This is the class alias name to use in the report. 11. Click the OK button to save these changes. 2. For the SalesQuery parameter, use the Default Value page. Choose specific values and add a default. 3. Click the Expression button (fx) to the right of the drop-down list box. 5. Select Parameters from the Category list and double-click the YearFrom parameter to add this reference to the expression. Type a comma followed by a space after this text. 7. Click the OK button to save the expression. 8. Add a textbox to the report. 12. Read and verify that the generated SQL is syntactically correct. The TOP value is set by the MaxRows parameter. The Freight column is included in the column list because the IncludeFreight parameter is set to True. The YearFrom and YearTo values in the WHERE clause match the parameters. The WHERE clause doesn’t include the SalesTerritoryCountry column because the Country parameter is set to All. Parameter values in this example are not being validated and could be subject to errors or code injection. Safeguards should be added before this technique is used in production. Ensuring Safe Threat-Free Computing practices. I accidentally stumbled across this and had to share it. This is just for fun. 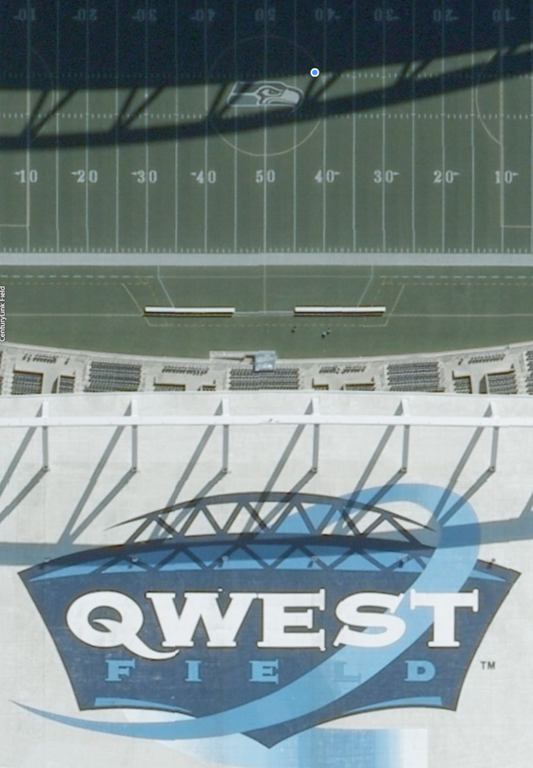 A couple of years ago when CenturyTel bought Qwest, the football field in Seattle changed its official name from Qwest Field to CenturyLink Field. With the growing popularity of soccer in the US, many people have stopped referring to the stadium as Seahawks Stadium because it is also the home of the Seattle Sounders soccer team. Open Bing Maps to an aerial view (not the birds eye view), locate the football stadium south of downtown Seattle and zoom in. 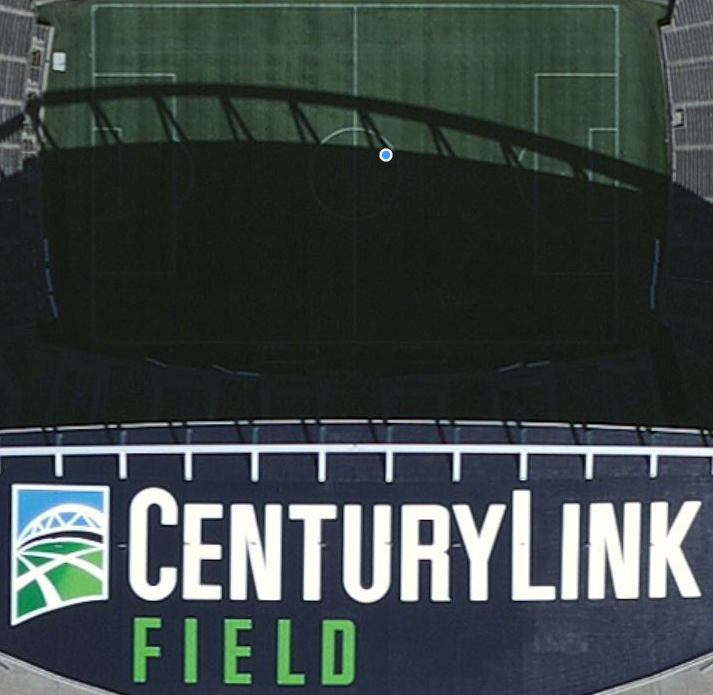 You will see the newly rebranded CenturyLink Field as a soccer/football field. Keep zooming in and it will magically transform into Qwest Field/Seahawks Stadium and an American football field. Wouldn’t it be cool if you could keep zooming in and see the Kingdome, old underground Seattle and the old steam ship yards? Seriously, I wonder if some day we’ll be able to not only see a composite satellite or street side view assembled from photos taken over time, but to also have the option to select the time frame of the images. Don’t bother comparing it to Google Maps. Their images of this area are newer and offer no fun transition.